Product prices and availability are accurate as of 2019-04-21 16:56:47 UTC and are subject to change. Any price and availability information displayed on http://www.amazon.com/ at the time of purchase will apply to the purchase of this product. Black Rhinestone Cross Jeweled Studded Belt Size Small. Ships Internationally, with standard and expedited options. Our Belts are measured from the leather fold to the center hole at the tip end. Take the measurement of a belt that you currently wear and measure from where the leather folds by the buckle to the hole that fits the best. That number in inches will be your belt size from our belts. 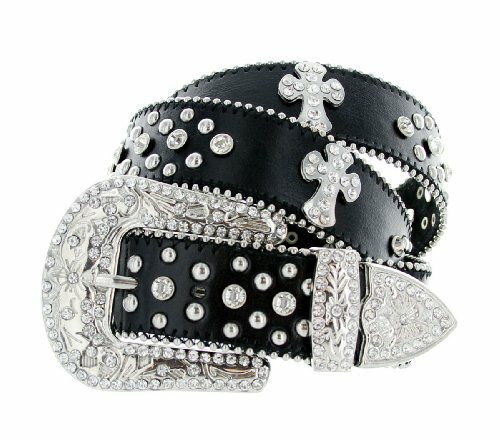 1.5" Wide - Large western-style buckle blinged out with tons of rhinestones Studded with cool bejeweled crosses More rhinestones and metal studs on the strap to complete the look Available in Small (31-33"); Medium (33-35"); Large (35-37"); XL (37-39"); 2XL (39-41") Our Belts are measured from the leather fold to the center hole at the tip end. Take the measurement of a belt that you currently wear and measure from where the leather folds by the buckle to the hole that fits the best. That number in inches will be your belt size from our belts.